Fortunately for America, the left keeps shooting itself in the foot; this time, with said foot firmly implanted in its mouth. I am talking, of course, about the ruling on Wednesday by activist judge Sarah Bolton on Arizona’s SB 1070 immigration bill. While her ruling might seem to be a setback for patriots opposed to the open borders policy of the Obama Administration, it does stoke the fire in the belly of conservatives and other patriots everywhere. If nothing else, the left seems intent on keeping the passions of patriots white hot until the November elections. We need to thank them for that. More than 70% of the voters support Arizona’s law and a majority of voters nationwide wants their Legislatures to pass similar laws. That is a large voting block for the left to alienate, and is another bone-headed action that could help lead to the destruction of the Democrat Party in the coming two election cycles. While the court’s ruling is only a temporary injunction until the full case in presented in court, it does for the time being, neuter the Arizona law. The court forbade the police from questioning the immigration status of suspects picked up on other charges. It also prohibited the enforcement of the federal requirement that immigrants have their immigration papers on their person at all times. It also struck down the part of the law dealing with the illegal immigrant’s ability to seek employment and perform work. It leaves in place, however, the right to bring civil suit against sanctuary cities that refuse to allow enforcement of immigration law in their jurisdiction. Drug dealers, rapists, muggers, carjackers, and so forth can now be bailed out and put back on the street instead of being turned over to ICE for processing and possible deportation, as has been the custom. I suppose that if an illegal immigrant flags down a police car and confesses to being an illegal immigrant, the officer can still provide taxi service to ICE headquarters, although that might be risky since the illegal can always change his mind and claim the officer demanded his “papers”. This is by no means the final chapter in Arizona’s fight against illegal immigration. All eyes are now on Sheriff Arpiao to see what he will do. He already has a planned crime and immigration sweep scheduled to take place regardless of the outcome of the court case today. Some have suggested that Arizona officials ignore the court ruling and continue with its enforcement plans. This would trigger a constitutional crisis and no one knows what the outcome would be. Frog marching Governor Brewer out of the Governor’s Mansion would certainly be an attention grabber guaranteed to provide at least a couple of day’s material for our friends in talk radio and the talking heads on TV. Even members of the MSM like the New York Times and MSNBC would find it hard to ignore. The next few days are going to be quite interesting. America is heading toward revolution. The time, type and nature of that revolution remain to be seen. Our Declaration of Independence expresses an undeniable truth drawn from thousands of years of humankind’s recorded history. Near the end of his life, Jefferson revealed that the thoughts expressed in the Declaration were not original or new, but were intended to be an “expression of the American mind”. The American mind has not changed since these words were written. We are perhaps less tolerant of tyranny than most peoples of the world, and the spirit of liberty still lives in the hearts of every true American. Eventually we will reach the point where the American people will no longer tolerate the continual disregard of our Constitution and infringement on the liberties it protects. Just when that point is reached and what the remedy will be is still an unknown and unknowable factor. The principles of socialism and the principles underlying our Constitution are mutually exclusive. The cost/benefit ratio between socialist promises and individual liberty must eventually be reckoned with. The level of anger among the American electorate has become palpable and continues to rise with every new outrage committed by the Obama administration. Anger alone is not enough, however, and if not properly channeled could prove to be counterproductive. What we need is a plan and a strategy that has a realistic chance of success. Fortunately, the founders left us a plan and a model that works without bloodshed. The question is whether the level of dissatisfaction on the part of the people is widespread enough or intense enough to make it happen. Thomas Jefferson faced a crisis similar to our own in the early days of the republic, except on a smaller scale. What most Americans do not realize is that the majority of the Founders favored a strong central government with the states subjugated to its authority. It was only due to the resistance of the Anti-Federalists and the refusal of several states, particularly New York and Virginia to ratify the Constitution without the assurance that a Bill of Rights would be added that allowed the Constitution to be ratified. Without the Bill of Rights, especially, the Tenth Amendment, it is doubtful the Republic could have survived its formative years with its liberties intact. The first test of the new Constitution came almost immediately after the new government took office, in the attempt to establish a national bank. 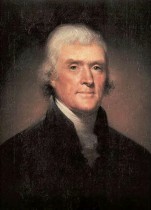 Thomas Jefferson, then Secretary of State, argued that the establishment of a national bank was not one of the enumerated powers given to Congress. Alexander Hamilton, Secretary of Treasury, argued contrary to his opposition to a Bill of Rights in Federalist No. 84, that any act not forbidden by the Constitution that contributed to the “welfare” of the union was permissible and therefore constitutional. 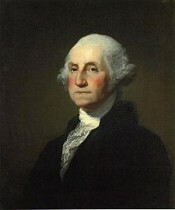 Washington was undecided, but eventually signed the bill into law. Soon afterwards, Hamilton and Vice President John Adams formed the Federalist Party for the purpose of strengthening the powers of the central government. Jefferson, as Secretary of State and later as Vice President and President of the Senate under President Adams, battled against the statist tendencies of the Federalist Party, culminating in what Jefferson referred to as “the revolution of 1800″ . Abuses of the Constitution under the Adams administration and the Federalist dominated Congress were so egregious that Adams was held to a single term and the Federalists lost control of Congress in the election of 1800. Jefferson won the Presidency in 1800 and with the aid of a republican Congress was able to reverse most of the damage done by the Adams administration. Over the next 24 years, Republicans Jefferson, Madison and Monroe were able to reestablish the nation on a firm constitutional basis. We need to replicate the Jefferson revolution in the elections of 2010 and 2012. The task is doable, but it will not be easy. According to Rassmussen’s daily presidential tracking poll, between 45% to 48% of American voters still consistently believe Obama is doing a somewhat satisfactory job. In spite of the anger felt by Conservatives and the frequently expressed confidence that Democrats will be defeated at the polls in the next two elections, there is little room for error and no room for over confidence. Strong independent or third party candidates could easily split the Republican votes and give both houses of Congress and the White House back to the Democrats. If we are going to repeat Jefferson’s revolution at the polls there are four steps we must take. For those states that have not yet had their primary, it is vital that voters familiarize themselves with the candidates and support and vote only for constitution conservatives. It is during the primaries that a real difference can be made. Illinois had its primary in February to make it easier for incumbents and harder for challengers to get their message out. As a result, we now have a choice between a progressive Republican and a progressive Democrat in the General election for the all-important Senate race. This increases the danger that conservatives will stay home in November or throw their vote away on an independent or third party candidate, “to make a statement”. In states that have not yet had their primary it is equally important the Tea Parties and Patriot groups get behind a single candidate if possible. Otherwise, we run the risk of splitting the conservative vote and getting a progressive, establishment Republican in the general election. That, to a degree is what happened in Illinois. In the general election we have to play the hand we’ve been dealt. In many cases the choice will be between a progressive Republican (RINO) and a Democrat. As difficult as it might be for some of us, it’s important that we support and vote for the Republican. The task for Republicans in the next Congress is to hold the line on spending and unconstitutional legislation. To the extent possible we also have to rely on Congress to defund the progressive programs established by this Congress and repeal as many unconstitutional bills as possible. One of the advantages—perhaps the only one—of party discipline in Congress is that if we can get enough conservatives in the House and Senate they can help keep the RINOs in line. We can “cull the herd” during the 2012 primaries. Retaking Congress in 2010 is absolutely essential if we are going to have any hope of reining in Obama over the next two years until we can kick him out in 2012. 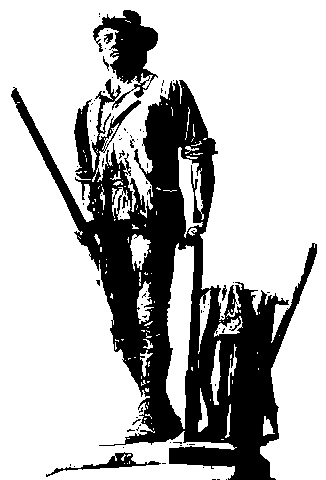 We will be going into the 2012 primary season with two years experience in organizing and motivating Patriot groups. We should be able to recognize conservative candidates better and not repeat some of the mistakes we made in 2010. We need to begin identifying potential candidates for 2012 immediately after the new Congress takes office, even if we believe we have elected a solid conservative to the office in 2010. Washington has a way of changing elected officials once they get in office. Congressmen and Senators who do not live up to their oath of office in 2011 should be challenged and defeated in the 2012 primary. It is important that we make it absolutely clear to those we elect this year, that if they do not honor their oath they will be replaced in 2012. Conservative Republicans and independents must form a solid voting block against “moderate” Republican establishment candidates. 2012 is the “must win” election at every level. Our objective in ’10 and ’12 is to damage and demoralize the Democrat Party to the extent that it will be years before progressivism raises its ugly head again. 2012 is “do or die”. If we fail to defeat Obama in 2012 there will be little chance for America to continue as a free republic. The Democrat Party will be fighting for its life. Voter fraud will be rampant. We can expect the “politics of personal destruction” to be the order of the day. It is important that all of us become more sophisticated in analyzing political propaganda and campaign rhetoric. Conservatives need to become so informed on the issues and so knowledgeable in the Constitution and our founding principles that we cannot be misled by slick sound bites and political spin. We cannot afford to end up with another McCain type candidate in the Presidential election. We need new people, not the same old ones with new faces. If we succeed in repeating the successes that Thomas Jefferson and the republicans accomplished during the first six elections after 1800, we can then begin considering the organization of an alternative party. Should history repeat itself, as it often does, the Democrat Party will fade away with many of its members drifting over to the Republicans further corrupting that party. That is the time to establish a new party based on conservative, constitutional principles that can preserve out liberties for another couple of hundred years. If we don’t do it now our children and grandchildren will be forced to take up arms to restore their liberty or live in servitude. That cannot be allowed to happen. Over the next few days, the American people will be participating in and watching the most important political drama of the last few hundred years. The question to be decided is whether America will continue as a constitutional republic or a socialist democracy. Nancy Pelosi and Barack Obama have pledged to have a health care bill ready for the presidential signature before Monday. Whether they will be able to or not is still an open question. A major demonstration is taking place in Washington today with patriot protesters from all over the nation attempting to persuade congressional Democrats to abandon their plan to pass a group of amendments as a substitute for the Senate bill, and then “deeming” the bill itself to have passed. If they succeed in this legislative slight of hand, the bill will go to the President. After adding his signature, it will become the law of the land. On Sunday, there will probably be a brief debate on the constitutionality of the procedure being used. There is not likely to be a constitutional debate on the bill itself. The Republicans will refer to Article I, Sections 5:6 and 7:3, arguing that the Senate Bill cannot become law without an actual vote on it by the House. The Democrats will counter with Article I, Section 5:3 which gives the House authority to determine its own proceedings. Hopefully, that debate will inspire many more Americans to actually read the Constitution for themselves. If the so-called “reconciliation” procedure succeeds in the House and the original Senate Bill is “deemed passed” as planned, President Obama will immediately sign the Bill into law. That will set off a number of lawsuits, including the one by Mark Levin’s “Landmark Legal Foundation”. How the courts will eventually rule on these questions is far from certain, based on past history. We applaud the thousands of patriots who are protesting in Washington this weekend and the tens of thousands across the country that will be participating in protests at their local Congressman’s offices. There is a good chance that our efforts will be successful in stopping the Democrat’s plan from succeeding —this time. However, it would be unrealistic to believe that we have accomplished any more than to slow down our transition to socialism. It is possible to win battle after battle and still lose the war. Progressives are patient and stubborn. They do not give up, and as long as we accept their basic premises, they will continue to chip away at our liberty until they have overthrown our constitutional form of government. The debate over health care gives us the perfect opportunity to examine our attitudes towards the experiment of self-government we have been engaged in for the past two-hundred plus years. If we accept the progressive’s (American socialists) basic premises, then we will eventually get all the changes Obama promised during his campaign. We emphatically oppose these premises because they undermine everything America has stood for since its founding. However, the overwhelming majority of the American people have already accepted them. This is clearly exhibited in the debate over health care. The underlying premise, framed by the Democrat Party, on which the health care debate is based, is that our health care system needs to be reformed, and that the reforms necessary can only be carried out by the federal government. This premise is incompatible with our systems of constitutional government and free market capitalism. In order to make the changes naturally implied by this hypothesis, it will be necessary to abandon our Constitution and convert our economic system to a centrally planned one. We believe that the American people have not yet examined the implications of accepting the progressive’s vision of “how thing ought to be“. Hopefully, this debate will force them to do so. That is not to say that we do not need a lot of changes in the way health care is delivered in America. However, those changes need to be made within the framework of constitutional government and free market capitalism that has proven to be the most successful systems yet devised by man. Today, the federal government (taxpayers) pays for over forty percent of the health care consumed in the country through Medicare, Medicaid, the VA, and SCHIP. Most of the balance is paid for by employer provided or individually owned health insurance policies. By comparison, the amount paid “out of pocket” by the patient for health care is infinitesimal. The market dislocation created by the increased demand brought about by the perceived availability of “cheap” or “free” services is the single most important factor in the exorbitant cost of health care. We cannot correct the problem by increasing the taxpayer’s, i.e. government’s, share of the market and decreasing the insurance companies’ share. Attempting to do so could lead to the bankruptcy of government, converting our current recession into a depression and guaranteeing its continuance, and the eventual abolition of liberty in America. We have consistently argued that the only thing standing between our liberty and outright tyranny is our Constitution. Never before has that fact been more evident than it is today. The Constitution is the “law” for government, setting forth those areas the federal government is authorized to have power over and those that are left to the states and the people. Health care is not one of the powers delegated to the federal government. Therefore, one of the first “reforms” we need is to get it out of the health care business. Market prices are the consequences of supply and demand. In order to bring down the price of health care we need to bring down the demand. This will only happen when patients accept the responsibility for paying for routine health care the same way they pay for routine car repair. Routine maintenance should be paid “out of pocket” and insurance should only be used for catastrophic or extensive care. These two changes alone would go a long way toward solving our “health care crisis”. 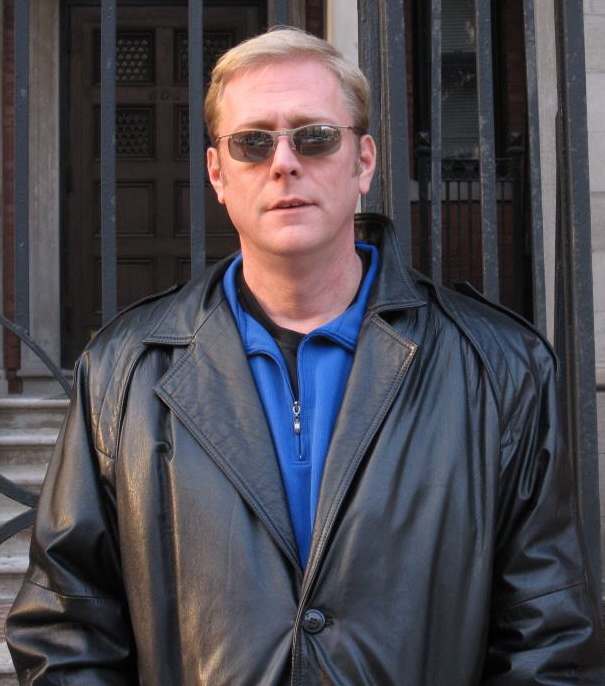 Posted on July 22, 2009 by Jerry McDaniel | Comments Off on Healthcare Bill Derailed? There is a good chance the healthcare bill being debated in Washington will be blocked, thanks to opposition by the electorate. However, in the end Obama will win because the debate has been shaped in a fashion the American people cannot win. The odds are that eventual healthcare reform will not contain most of the features in the current bill, but the momentum is there for some type of reform detrimental to the welfare of the nation. Everyone seems to have accepted the underlying premise of the debate that fixing healthcare is the duty of the federal government. No one is pointing out that the problems with healthcare, like most of the problems with the economy in general, can be laid at the feet of Congress. More than anything else, the unaffordable cost of healthcare today is caused by the distortions in the market created by the fact that government is the single largest purchaser of healthcare. If we are to make any headway in getting the cost of healthcare under control, we have to begin with a debate as to whether or not healthcare is a proper function of the federal government. The Founders, taking into account the expanse and diversity of America, deliberately limited the functions of the federal government. They understood that attempting to govern citizens in a variety of states covering a large geographical area with differing customs, problems and needs could not be accomplished by a central government without major sacrifice of liberty. Nowhere in the Constitution do we find any authorization for the Federal Government to be involved in healthcare. Neither do we find any indication in the writings of the Founding Fathers that they would be in favor of government involvement in healthcare if they were alive today. That is not to say that government has no role in the health of its citizens, just not at the federal level. A good first step in solving America’s healthcare problems would be accepting the intentions of the Founders when they proposed and ratified the tenth amendment. The proper place for public health issues, including medical care for the indigent and the regulation of insurance, if necessary, is at the state and local level. If we continue to accept the premise of the statists that healthcare is the proper role of the Federal Government it is only a matter of time until we have socialized medicine. Obama and the Democratic Party may not be successful in getting a nationalized health plan this time, but they will be back again. Each time they propose it they get another step closer to succeeding. Control of the nation’s healthcare has been the goal of left leaning politicians since the administration of the Progressive-Republican President, Theodore Roosevelt. Franklin Roosevelt, Truman, Johnson and Clinton, each in turn, made an attempt to institute universal coverage. Johnson signed into law the Medicare and Medicaid programs which eventually led to government control of some forty percent of the nation’s healthcare. The increased demand for healthcare services brought about by these programs led to an inevitable increase in price. That, added to the customary employer provided healthcare plans instituted a couple of decades earlier as a way of getting around wage controls and exorbitant taxation, helped to create an expectation on the part of the public that they should never have to pay for any health care “out of pocket”; someone else should always pick up the bill. We may accept a bill for hundreds of dollars from our local mechanic for minor repairs on our car without complaint, but panic at the thought of paying for a routine trip to the doctor for treatment of a common cold. Until the expectations of the public changes in this regard and until we get the overall government involvement in the healthcare system out of the hands of Washington and back into the hands of the state and local governments where it belongs, we are going to continue to deal with repeated efforts to socialize medicine. If we do not change the way we think about the question of healthcare, Obama wins. Comments Off on Healthcare Bill Derailed? With the upcoming retirement of Supreme Court Justice David Souter, speculation naturally turns to the type of person President Obama will nominate to replace him and who that person will be. Since the primary responsibility of the Supreme Court is to apply the Constitution to laws passed by Congress, to determine its constitutionality, it is also natural that the subject of the Constitution would be a major topic of discussion. Invariably when it does come up, we are reminded that Obama is a constitutional scholar and a Professor of Constitutional Law. He did teach constitutional law part time at the University of Chicago, but his title was instructor not professor. It also seems to me that “scholar” is an exaggeration of Obama’s dept of knowledge concerning the Constitution. I have no doubt that he understands the Constitution; he just does not accept it. Obama often professes a love for his country. I cannot see into his heart to know his feelings, but I can listen to his words and watch his actions. The evidence is that he rejects America as it is currently constituted and has been for the past 220 years. He rejects its history. He rejects its culture. He rejects its historical values and he rejects its Constitution. In an interview with WEBZ-FM radio in Chicago, September 6, 2001 Obama had this to say about the Constitution. More recently, he explained the criterion he would use in selecting judges to the federal courts. It is obvious from these and other statements by Obama that he bears no allegiance to the Constitution. The political class of both parties has used the rulings of rogue courts and the application of the English Common Law doctrine of judicial precedent to reduce the Constitution to a meaningless document in limiting the powers of the federal government. Unless we can find some way to reverse this trend, liberty will become something our grandchildren only dream of as they slave away their lives in servitude to the state.